Let’s see if we can get a post in here for August! We came back from a short trip to Pittsburgh where we were able to mix business and pleasure (family, a concert) and today is catch up day. 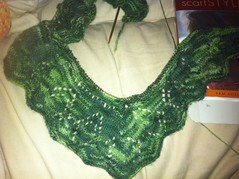 I have been knitting – working on the Ene Shawl (Rav link) and a sock for Bob from yarn bought at Rhinebeck last October. 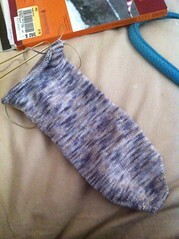 Starting chart 3 on the shawl and the heel on the sock. I will post of more things wondrous and tear-inducing (on my part at least) next time! Ooh! Knitting!! I should do some of that.